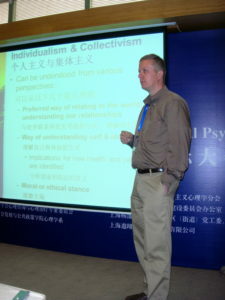 Louis Hoffman, PhD is a faculty member at Saybrook in the Department of Humanistic and Clinical Psychology. He teaches primarily in the Existential, Humanistic, and Transpersonal Psychology Specialization; however, he also teaches in the Creativity Studies and Consciousness, Spirituality, and Integrative Health Specializations as well as in the Transformative Social Change Degree Program. He is available for essays, theses, and dissertations. I am available to chair and serve on essay committees at Saybrook University. If you are considering talking with me about chairing or serving on your committee, I would encourage you to review my vita to get a sense of my interests and professional experience. I would also encourage you to set up a time to meet at one of the Saybrook Residential Conferences or schedule a time to talk by phone or Skype. I am available to chair and serve on Masters theses and projects at Saybrook University. If you are considering talking with me about serving on your committee, I would encourage you to review my vita to get a sense of my interests and professional experience. I would also encourage you to set up a time to meet at one of the Saybrook Residential Conferences or schedule a time to talk by phone or Skype. I am available to chair and serve on dissertation committees. If we did not work together on your essays and you are considering talking with me about your dissertation, I would suggest that you begin by reviewing my vita to get a sense of my interests and professional experience. I would also encourage you to set up a time to meet at one of the Saybrook Residential Conferences or schedule a time to talk by phone or Skype.